The town of Pinhook, Missouri was founded in 1927, by a group of black sharecroppers from the surrounding area. The town, about ten miles west of the main channel of the Mississippi River, took its name for a nearby ridge that resembled the tip of a pinhook. These new residents cleared the low-lying swampy land acre by acre, eventually forming a community that at one time numbered close to three hundred people. The town grew to include a church, grocery store, and three schools. Most of the residents were related by blood or by marriage. In 1932, the Army Corps of Engineers built the Birds Point-New Madrid Floodway to ease the annual flooding along the Mississippi River. The floodway, when used, however, put the excess waters directly in the path of the town. 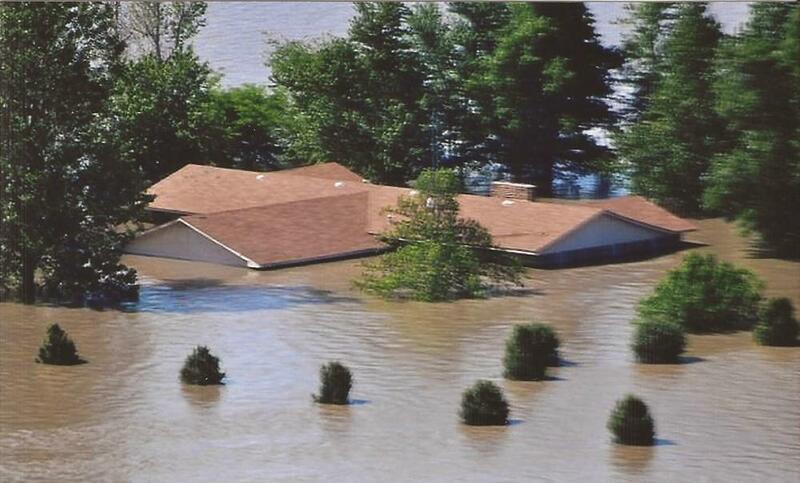 From that point the citizens of Pinhook lived under the constant threat of flooding even as new levees were put in place to protect other larger communities in surrounding states and counties. Flooding in 1973, 1975, and 1979 caused increasingly more devastation to the low-lying community, causing residents to sell off their farm lands and the population of the town to decline. According to the 1990 census only 52 residents remained. By 2000 there were 48, and by 2010 only 30. The average household income was $22,000 a year. During the summer of 2011, the Mississippi River began to rise again, and discussions were held between the Army Corps of Engineers and flood control agencies in Illinois and Missouri about blowing the Birds Point-New Madrid Floodway to protect the residents of Cairo, Illinois who were further downstream. The residents of Pinhook were not included in those discussions, and were never given any notice, despite calls from Pinhook’s unofficial mayor, Debra Tarver. In fact, Tarver found out about the oncoming flooding of Pinhook by word of mouth, and received her confirmation by notice of a television announcement. On May 2, the day of the floodway water release, local residents had only hours to gather themselves and their belongings before the town would soon be under fifteen feet of water. They received no assistance from any local or federal agency in evacuations. Blowing up the levee completely destroyed the town of Pinhook, Missouri. After the waters receded, many of the homes and the last local church were burned down. Although Tarver and other Pinhook residents protested to county and state officials, no action was taken and no charges were ever filed against the flood control supervisors who ordered the destruction of the town. In 2015, the last of the remaining buildings in Pinhook were knocked down. In late January, 2018, the Missouri Department of Economic Development awarded a $450,000 grant to the Pinhook community to purchase land and help with relocation construction costs in nearby Sikeston, Missouri where house foundations had already been laid for 10 of the remaining 30 residents of Pinhook. Undeterred by their fate, the residents and descendants those who had lived in Pinhook, Missouri, continue to gather on Pinhook Day, celebrated on Memorial Day, to share their history and continue the story of their small community. David Todd Lawrence and Elaine J. Lawless, When They Blew The Levee: Race, Politics, and Community in Pinhook, Missouri, (Jackson: University of Mississippi Press, 2018); Scott Moyers, “The death of Pinhook: Community will never return after flooding, residents say,”, Semissourian.com, June, 2011, https://www.semissourian.com/story/1737132.html; Mark Bliss, “Housing project gives former Pinhook resident a new sense of community,” Semissourian.com, January 2018, https://www.semissourian.com/story/2479957.html.